At Whole Foods Market, we believe you have the right to choose what’s in your food. Genetically Modified Organisms (GMOs), also referred to as products of genetic engineering, are organisms whose genetic makeup (DNA) has been altered in a way that does not occur naturally. 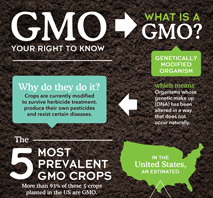 Want more info about GMOs and GMO products? At Whole Foods Market, we believe you have the right to choose what’s in your food, and we are committed to GMO (genetically modified organism) transparency. Currently, we offer thousands of products in our stores that have met requirements for an organic (thus non-GMO) or non-GMO-verified label. As always, our goal is to provide our customers with information to make informed choices. Nearly all grocery stores in the U.S. sell foods with GMOs. They are pervasive — more than 70% of packaged foods in the U.S. contain GMO ingredients or ingredients derived from GMOs, and the federal government does not require disclosure of GMOs in food. 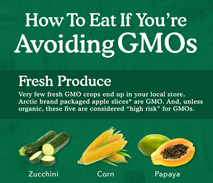 The good news is that we have solid tips for How to Shop if You're Avoiding GMOs.